Mel celebrating Senior Hunter passes with (l to r) “Kosmo” – CH Derby’s Read Em And Weep MH, “Remus” – CH Shakin My Booty Rezzamatazz SH CGC, “Suede” – BIR CH Boulder’s Power of Persuasion CD RE MH VC ROM. What are AKC hunting tests and titles for pointing breeds (Junior Hunter, Senior Hunter, and Master Hunter)? 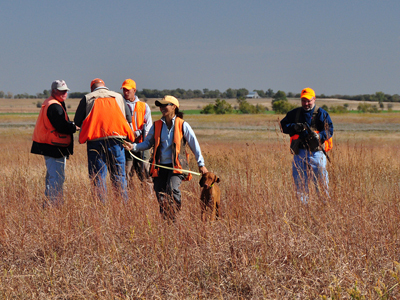 First, AKC hunting tests are games (just like field trials) you can play with your bird dogs. They can be seen as a great way to extend the bird hunting seasons and an excellent venue in which to test your bird dog’s level of natural ability, trainability, independence, drive, intensity, and all of the other things we look for in great hunting dogs. 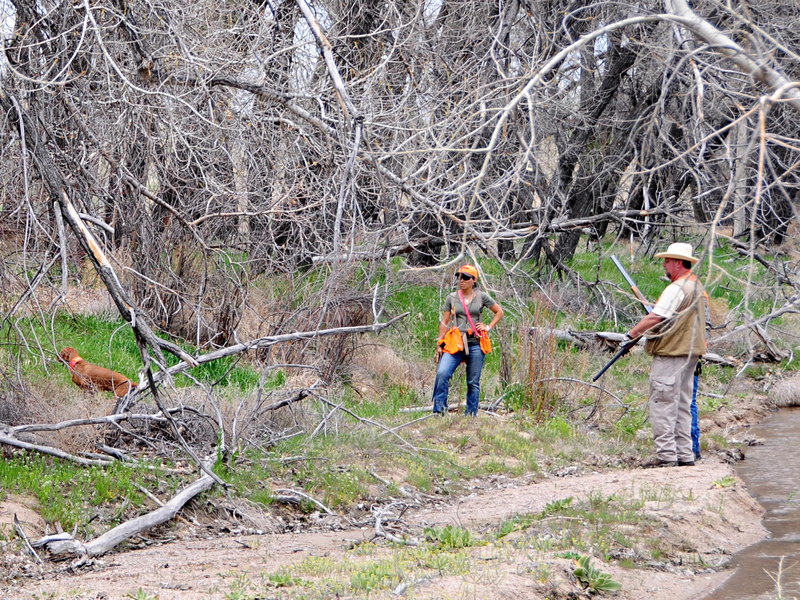 Hunting tests also help gauge your abilities as a trainer and handler. :-) (Read the previous line again and let it settle in.) Flushing, retrieving, and pointing breeds have hunting tests but are different from each other as they’re designed to test for traits specific to each sporting group’s purpose. Since our experience is with pointing breeds, this post will specifically address the requirements of Junior, Senior, and Master hunting tests and titles for pointing breeds. A quick note about our experience–Aaron and I are AKC hunting test judges. We’ve been playing these games (hunting tests and walking field trials) since 2003 and have put a lot of miles on the car training for and actually attending tests and trials throughout the country. We’ve trained, trained with, and watched a lot of different dogs over these years. Hunting tests are noncompetitive events in which dogs entered are judged against a standard and not against each other. This means every single dog entered in a test can (theoretically) be given qualifying scores which means s/he would “pick up a leg” or a pass toward her/his hunting test title. A dog can’t “win” a hunting test—but he can “qualify” or “pass”. This is different than AKC field trials. Field trials are competitive events in which dogs defeat each other for wins/placements. To learn more about AKC field trials, read our “What Exactly Is This “Field Trial” Business All About Anyway? The Basics Of AKC Field Trials” post. Live game birds such as quail and chukar are used in tests. How a testing dog handles each bird she comes into contact with, determines whether she will pass. The rules of how a dog must handle her birds are different for each level: Junior, Senior, and Master. All levels also test how dogs (referred to as “bracemates” in hunting test jargon), interact with each other. The rules for these interactions vary by test level. Once a dog has earned a hunting test title the abbreviation for the title will be added to the end of the dog’s AKC registered name. An example of what a dog’s registered name will look like after earning a Master Hunter title is, Random’s Best MH. 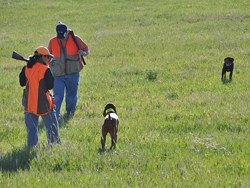 What are the different levels of AKC hunting tests? The tests are offered at three levels: Junior Hunter (JH), Senior Hunter (SH), and Master Hunter (MH). Recently, the AKC has approved 3 new titles: Junior Hunter Advanced (JHA), Senior Hunter Advanced (SHA), and Master Hunter Advanced (MHA). Here’s the link to read the AKC’s memo on these new titles, http://www.akc.org/pdfs/events/hunting_tests/pointing_breeds/PBHT_Advanced_Titles_Intro.pdf. What exactly happens in a test? What should I expect? First, we’ll give a very broad overview then later get into more detail about the specifics of each level. “Amante” – CH Boulder’s Bolder Amante MH stands on point as owner/handler Mel works to find the bird. Mel is looking back toward Amante to try and get a better “read” on where the bird might be based on the direction of Amante’s nose and eyes. play with, fight with, or just follow her bracemate around. Ideally, the dogs in a brace should ignore each other after the initial “dog hello” and each go their separate ways to hunt for game. Each brace for Junior Hunters should be a minimum of 15 minutes and a minimum of 30 minutes for Senior and Master Hunters. Two judges will usually observe each brace off of horseback but can also judge from foot (walking) or ATV. The same set of judges will be used for an entire test level unless of an emergency. Handlers will work their dogs from foot. Though a line marshal will help keep track of the braces that are out testing, it is the responsibility of each handler to be at the line and ready with their dog when their brace is up. Handlers are allowed a 5 minute grace period from the time the judges are ready for the brace after which the judges are allowed to disqualify the dog. Dogs should be kept on leash and under control at all times unless running in a brace. All dogs should be “brought to the line” on leash. Once the judges signal the handlers to release their dogs, the judges mark the start time. The judges will first let the handlers know the direction of the course and answer questions. The judges will separate as the handler/dog teams separate but will observe both of the testing dogs. The judges will pretty much just ride along quietly observing the handler/dog team and only provide information for things like the layout of the course, where water barrels will be, etc. 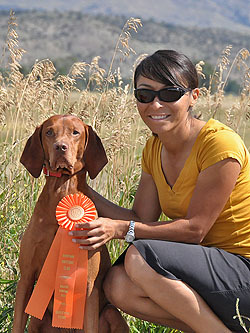 Judges will warn if they feel dogs are interfering with each other or if handlers are not following the rules of the test as written in the “Regulations for AKC Hunting Tests for Pointing Breeds.” Handlers should always feel comfortable asking the judges questions throughout the test –especially those new to the sport. Most host clubs will design courses with bird fields but this isn’t always the case. Some will have continuous courses (meaning no bird field but rather a loop or out-and-back style course). This style of course has more of an impact on Senior and Master level dogs as gunners walk along with each dog/handler team and will attempt to shoot each pointed bird. The judges should let the handlers know when giving the handlers the layout. This does not mean if a bird field is used that birds won’t be found on the back course as birds are also released into the back course and move about throughout the day. 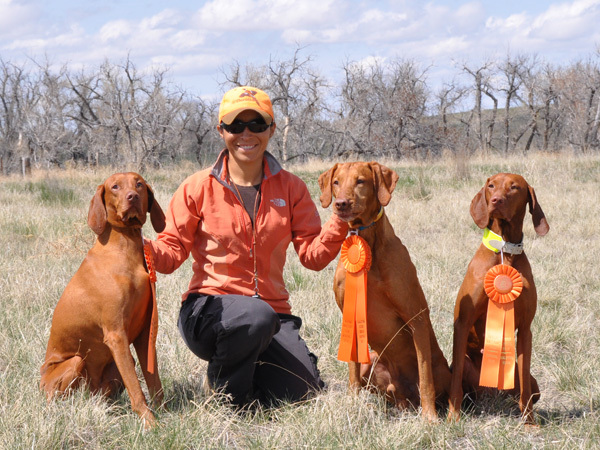 All bird contact—whether in the back course or bird field—will be judged as long as the judges sees the contact and how the dog handles his birds. If there is a bird field, birds in the back course are “blanked” by the handler. In Senior and Master level tests gunners will attempt to shoot pointed birds in order to demonstrate a dog’s understanding of steadiness to the shotgun, honoring, and retrieving. Birds are never shot in Junior level test–only “blanked” by the handler. Once the judges have called “time” the brace is up and the working dogs should be called in and leashed up. The judges usually won’t tell the handlers right then whether their dogs passed or not. Instead, they will want to confer and agree upon scores. A handler can find out from the club’s event secretary if their dog passed as the secretary will try to collect the judge’s score sheets after each brace. Be respectful though. The judges, secretary, and other club members are very busy working to make sure the event runs as smoothly as possible. If the judges decided to pass your dog the event secretary will have a ribbon for you (and your dog’s scores if you ask to see them). I’ll address the scoring system (passing scores) a bit later in this post. “Amante” – CH Boulder’s Bolder Amante MH hunts the back course in an AKC hunting test. Love this girl’s hunting range and desire! How do I get an AKC Junior Hunter title on my dog (What are the requirements to pass a Junior Hunter level test)? The short of passing the Junior level test is that a dog must actually hunt (seek likely objectives where game might be) and show some level of independence (no need to be a “big runner” but shouldn’t hang by his owners side—remember, these are pointing dogs not flushing so your dog’s hunting range should reflect this). A dog must find and hold point on at least one bird in order to be considered for a passing score. 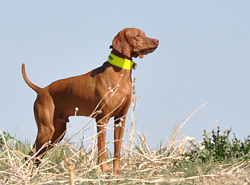 A Junior dog “must establish point on at least fifty (50) percent of the pointable birds it encounters.” Though not required to be steady to wing (much less shot), the dog must hold point “until the handler gets within normal gunshot range.” This of course depends on the distance the dog is from his handler when he establishes point. A blank cartridge will be fired by the handler after each pointed bird in order to demonstrate their dog isn’t gun-shy. Gun-shyness—any sign of gun-shyness should not be tolerated (and the testing dog not passed). Sadly, many owners do not properly introduce the gunshot to their dogs, thus making the dog gun-shy. This is a trainer/owner induced fear and can be prevented by properly and safely introducing the sound of the shotgun to your pointing dog! How do I get an AKC Senior Hunter title on my dog? GCH Boulder’s N Fusion’s Heartbreaker CGC pointing a bird in an AKC Master Hunter test with co-breeder/owner/trainer handling. They qualified for Crush’s fourth MH pass!! A Senior Hunter (SH) title is awarded to a dog with 4 (if the dog has been awarded a Junior Hunter title) passes at the Senior level. If a dog does not have a Junior Hunter title, an additional pass (for a total of 5) will be required for an SH title. A Senior level test will run for 30 minutes. A Senior dog will be “steady to wing” on all birds he points (meaning the dog can break at the shot and not be disqualified but cannot break or move at the flush—for all birds he points). All birds, except those to be shot by a gunner, will be blanked by the handler. All pointable birds must be pointed by a dog testing at the Senior level. A Senior dog must demonstrate a retrieve. Senior dogs must retrieve every shot bird that is deemed retrievable during the test. 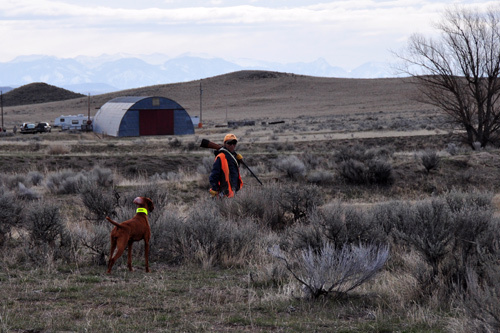 If there isn’t an opportunity to shoot a bird for the testing dog during the 30 minute brace, and the testing dog has not been disqualified, a “call back” for the retrieve will done. Retrieved birds must be not be rendered “unfit for consumption” (meaning a dog cannot “hard mouth” or squish the heck out of or otherwise chew up a bird he is retrieving). Retrieves need not be to hand but should be to within a step or two of the handler. A Senior dog should handle more “kindly” for his handler than a Junior dog. This is scored under the Trainability category. An example of this would be a “stop to flush” (wild flush) situation. Ideally, you want your dog to be trained to stop himself at a wild flush. But, it is acceptable in a Senior level test to command a dog to stop or “whoa” at a wild flush. A blank shot may be fired after the dog has proven steadiness and the dog may be “collared away” from the direction of the flushed bird if the handler chooses. A Senior dog must demonstrate an honor in order to pass a Senior level test. At the Senior level, a dog may be given a command to honor by her handler but she must first see and acknowledge the pointing dog before being given a command to stop. This is because a Senior dog may not steal point. If a dog steals point in a Senior test she cannot be passed by the judges. The handler may leash the dog during the honor if the pointing dog is to be sent for a retrieve (so as not to interfere). Honors established on the back course will be credited. German Wirehaired Pointers and a Spinone Italianos need to pass an AKC Water Test at a licensed or member field trial or hunting test. So what are the most common “gotchas” in the Senior level hunting tests? Hmmmm…kinda sounds like too many Junior level dogs are testing in Senior, eh? ;-) Because I’ve seen these mistakes at the Senior level so often, I was inspired to write about it—“Playing American Kennel Club (AKC) hunting test games at the Senior and Master levels”. You’ll hear Senior Hunter dogs referred to as “green broke”, meaning they’ve just been “broke” or steadied. Green broke dogs are often livin’ life on the edge as they work hard to implement their newly learn skills (over their fun days of running as a Junior Hunter!). How do I get an AKC Master Hunter title on my dog? “Kosmo” – CH Derby’s Read Em And Weep MH and owner/trainer/handler Mel celebrating his NEW MASTER HUNTER TITLE! A Master Hunter (MH) title is awarded to a dog with 5 (if the dog has been awarded a Senior Hunter title) passes at the Master level. If a dog does not have a Senior Hunter title, an additional pass (for a total of 6) will be required for an SH title. A Master Hunter level test will run for 30 minutes. “A Master hunting dog must positively demonstrate its steadiness to wing and shot” (meaning the dog must remain steady through the flush of the bird, gunshot(s), and until released by her handler). All birds, except those to be shot by a gunner, will be blanked by the handler. All pointable birds must be pointed by a dog testing at the Master level. Should a “wild flush” situation occur, the dog testing in Master Hunter must demonstrate a “stop to flush” on his own, without a command. The handler may NOT collar a Master dog but must heel the dog away. Delayed chases are not acceptable in Master level tests. A Master dog should handle “kindly” with an absolute minimum of “hacking” needed by her handler. This is perhaps the most obvious difference between a Master Hunter and a dog competing in a field trial Gun Dog stake–handling kindly. There is a whole lotta handling (aka “singing”) in field trials. Master braces are much more quiet than Gun Dog stakes. A Master Hunter is required to retrieve every shot bird that is deemed retrievable–perfectly, to hand during her brace. And, a Master Hunter must demonstrate an honor–through flush, shot, and retrieve. Multiple honors and retrieves may occur throughout the courses of a Master Hunter brace. A lovely thing to watch for those who truly appreciate finished gun dog work! A Master dog “must point staunchly, and must be steady to wing and shot on all birds.” If a dog testing at the Master level breaks at the flush or shot she cannot receive a qualifying score. A Master dog must demonstrate an honor in order to pass a Master level test. At the Master level, a dog may NOT be given a command to honor but rather, must establish an honor on his own. After the dog has established an honor on his own, the handler can then quietly caution the dog to remain in position. The handler may NOT leash the dog during the honor nor may the handler “block” the dog from watching the pointing dog as the bird is flushed, shot, and retrieved. Master dogs must never steal point. If a dog steals point in a Master test he cannot be passed by the judges. Dogs will not be given credit for honors on the back course because a “a Master dog must honor throughout the entire flush, shot and retrieve”—for every honor during the test. “Suede” – BIR CH Boulder’s Power of Persuasion CD RE MH VC stands in a very difficult honor. We were very nervous the other handler would end up flushing the bird right up into Suede’s face! This is a perfect example of a “true” honor though. Look at the dog–no way Suede could be scenting (pointing) the bird. She saw the dog establish point then stopped and honored. Classy! The handler must also carry an empty or an imitation model shotgun (weboughtours from Cabelas—the Monte Carlo Toy Shotgun—much lighter/easier to carry!) during a Master Hunter test. When a bird is flushed, the handler must shoulder the shotgun and swing on the bird, following it’s flight as if to take a shot. The reason for this is a dog is more likely to make a mistake (move or even break) when her handler turns away and shoulders a shotgun. This requirement helps prove the absolute steadiness of a dog testing at the Master Hunter level. Bottom line for Master Hunters is they are considered a “finished” or “polished” gun dog. If you love watching the finest of pointing dogs in their element, a true Master Hunter (not one of these obedience-style robots you often see in AKC hunting tests) running in a test can put goosebumps on your arms. These are the dogs you would dream of taking home with you. You can appreciate these beauties even more once you’ve grown a puppy up all on your own—reaching all of those milestones with your dog—from first bird contact to teaching an honor without a command and a perfect retrieve to hand. So what are the most common “gotchas” in the Master Hunter level tests? Failing to honor on her own (without a command)—“blinking” honors seems to be quite common in Master Hunter tests. “Amante” – CH Boulder’s Bolder Amante MH and owner/trainer/handler Mel leave the “call back”. Amante qualified after a very, very difficult call back situation in which the dog sent to honor Amante’s point stole her point then flushed and chased the bird. YIKES! No wonder Mel has such a huge smile–of relief! How do I find hunting test events to enter? For Colorado and some of our nearby states you can find field events online at www.fieldtrialnews.com. All AKC events should be listed on the AKC’s website under the “Events” tab. Find an event you want to enter and download the corresponding “premium” (a brochure with event details and entry form) or email/call the person listed as the secretary and request a copy of the premium. The premium will have instructions on where to send your entry form and payment as well as contact info for the host club. The event secretary will then notify you of the running order (they usually send the “brace sheets” to all participants) and any additional information about the event. Call “point” before moving in to work a bird. Don’t be shy! Take a moment to look around and find your judge then raise your hand or hat and call “point”. Be careful to not call point when your dogs is still “working” a bird or if your dog looks uncertain/soft (may be a “hotspot”–old scent where a bird was hunkered down, or a pile of feathers) though. Too many “false” points can paint an unattractive picture. Bring your own stopwatch and keep track of your own time. Doing so will help your strategy to qualify your dog. Females in heat/season are not allowed to run or even be on the grounds of the event. Dog attacks: Are never fun for anyone! Make sure your dog knows how to play nice and not harass other dogs as he will run with a bracemate. If your dog does attack his bracemate, the judges can decide if the attack warrants a DQ. After 2 DQs, your dog will no longer be allowed to enter hunting tests. Blaze orange attire is required for Senior and Master level tests (live ammunition will be fired–“hunter” orange is required for safety issues). No need to spend big bucks on fancy hunting vest (though the “game bag” part of these vests do excellent double-duty for carrying water bottles and place to stash your leash)–you can pick up an inexpensive $5 safety vest from Walmart (check the hunting/ammo aisles). Food-Usually, the host club will have lunches for purchase available onsite. It’s a good idea to pack a cooler with energizing snacks and drinks. Make sure to pack a lawn chair as well as there is much downtime at these field events. Part of the fun of these events is the socializing. Take your time, make a day of it and get to know your fellow bird dog guardians. This can be a great way to network with others with your same passion—you may end meeting a number of training/hunting partners! Clothing/gear-Wear comfortable clothing and shoes. You’ll be walking in uneven terrain with a variety of ground cover. Make sure you wear the right footwear, pants, and layers as the day often starts cool then warms up—or gets colder. Check the weather before heading out and pack appropriate gear. Field events are only cancelled if the weather becomes dangerous or prohibitive to testing/trialing. If testing in warmer months, don’t forget the sunscreen! Dogs must be registered with the AKC in order to enter hunting tests and must be at least 6 months old on the day of the event (for all levels). Try to get some space between you and the other handler. This will give your dog a better chance to get into his own birds instead of being distracted by his bracemate or the other handler. WALK BRACES!!! It’s most helpful to walk braces at the level your dog will be testing but if this isn’t possible (your dog is running in the first or second brace) walk at whatever level time allows. Walking braces at all levels also helps you learn more about AKC hunting test games—especially if you’re a newbie to the sport. You’ll also learn a lot about different dogs and handlers—good and bad. J Walking braces also helps you understand where the birds are being planted and where the flushed birds are landing. Testing dogs should be able to hunt and find birds on their own but there are times when the scenting conditions are so terrible guiding your dog into an area where birds might be could increase your chances of qualifying. For goodness sakes READ the “Regulations for AKC Hunting Tests for Pointing Breeds”!!!! HAVE FUN! If you can’t have fun when testing your dogs in AKC hunting tests—qualifies or not–then perhaps you should consider a different sport. PRACTICE SPORTSMANSHIP!! Check out our philosophy on this topic as well as the AKC’s Code of Sportsmanship. Seriously, take a few moments to read these and let the words settle in. Then, read them regularly. If all exhibitors took the time to do so—and the practiced this code, these events would be even more fun than they already are. “Suede” – BIR CH Boulder’s Power of Persuasion CD RE MH VC stands in an honor during a call back in an AKC Master Hunter test. 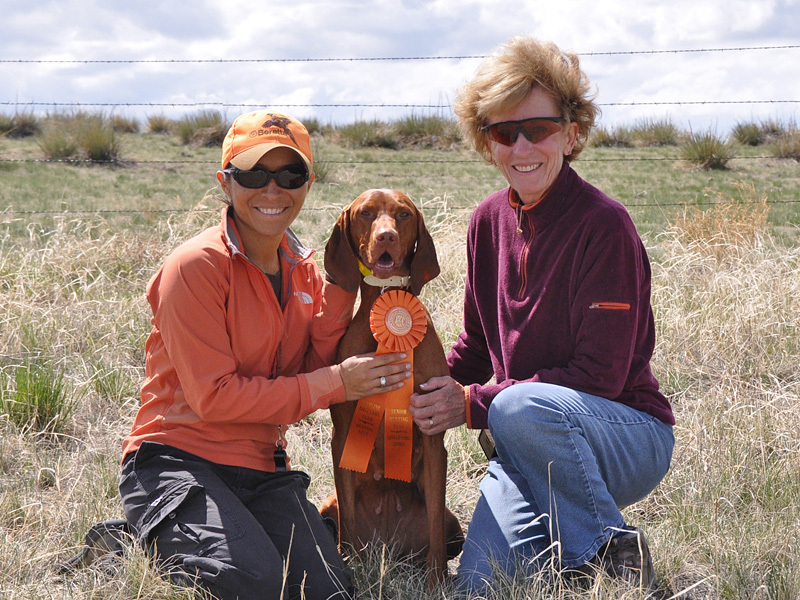 Breeder/owner Judy Hetkowski of Boulder Vizslas stands by Suede. 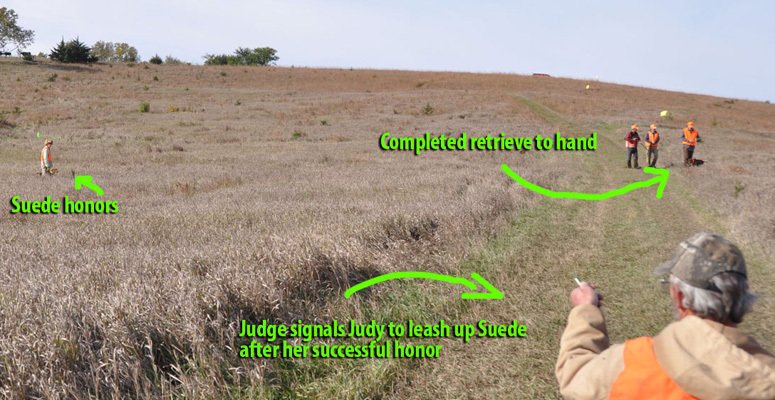 Check out the distance of Suede’s honor! And–the thick cover she was in–tough to see a dog standing point. She qualified!